But why is it so that some of the stores become very popular with the customers despite the presence of big players that offer a wider product range and deeper discount? What tactics do they employ to charm the customers? Do they use strategic marketing or is it something more creative and cost-effective that makes these sites sticky and favourite among customers? What brings and keeps your customers on your site? Definitely, the products and deals, right? But is that all? Will the customers come to your site if you have a sloppy website design? No, never! A beautiful design theme is a primary requirement for making a site engaging and creating an indelible impression on your customers. A site design not only displays your products but it also speaks to your customers. Creating a stellar first impress can solidify your relationship with your customers forever. Also if you manage to apply device optimized themes it would give added value to your store. When you create a WOW ecommerce website template for your store, it not only attracts your customers but also offers stickiness and eventually makes them place an order. A refreshing site design also helps in increasing the ticket size of your business. An aesthetically pleasing website with great UI/ UX is the key to keep your customers coming back to buy more and more. Let's accept it, we are addicted to our mobiles. It’s our companion, our Bible and literally our lifeline. Research by British scientists suggests that average adults check their mobile almost twice as many times as they estimate they do. Checking our smartphones every few minutes has become a habit and hence it is natural that we end up searching for products or services on our smartphones. This makes it imperative that when you build online store it should be easily accessible on mobile devices. To achieve the maximum attention and retention of your target customer segment your website should be accessible on every type of smartphone starting from the most basic level to the very high-end devices. To achieve this, your site should be built using the latest technology that makes your online store fast, engaging and accessible on shaky internet connections as well. A high performance, quick loading site that loads even on slow internet speeds acts as a magnet for customers. Also, try to keep your checkout flow simple and mobile-user friendly so that your customers coming back for more. You can create the most awesome looking store using the best technology but the key differentiator that can make your customers coming back is the fast and timely delivery of orders. Online buyers need instant gratification and the only way to provide it is by offering a streamlined shipping solution that allows them to have their product with them in the shortest possible time. Hassle-free shipping is still a dream for most of the online stores. Due to the high upfront cost of the reputed shipping and courier services, it becomes difficult to use the services of multiple shipping providers for deliveries. This results in delivery delays and frustrated customers who drift to other reputed online stores. To make your ecommerce store the favourite buying hub for your customers you should be using multiple ecommerce logistics solutions that enable you to optimize your delivery timing and keep your customers happy. Needless to say, a happy customer who received his orders on time would not only keep buying more but would also work as a brand ambassador by doing word of mouth publicity. Social media has revolutionised our lives like never before. It is the place where your customers are all the time engrossed in friendly banter, weightier socio-political issues or looking for products and services they need. Social media gives you a clear insight into what your target audience is looking for and how your competitors are working to attract them. When you build online store, simultaneously you should start building your social presence across various social channels. Your social pages can become an additional channel for conversion and retention when used along with a smart marketing strategy. The insights that you gather from the customer-generated content on these channels can be used to engage your customers better eventually boosting your sales. You can start contests based on your customers’ liking and also offer them brownie points or discount coupons for each purchase. This strategy will keep them hooked and they would pull new buyers to your sites by sharing these special deals. We all love a personal touch and it can be an effective tool in creating a reputation for your brand. After you build online store and start selling, you should also focus on keeping your customers engaged using multiple channels. Bolster the efforts of your customer support team by adding unified notifications to your online selling site. By using email, SMS, browser and mobile push notifications you can not only keep your customers engaged and informed but can also use these as the effective marketing and retargeting tools. When your customers abandon their cart midway, or when they are just surfing the net, you can send them special deals using all or a combination of these notifications and pull them back to your site for another order. StoreHippo top ecommerce platform has ensured that you can apply all the above tips in your store easily. 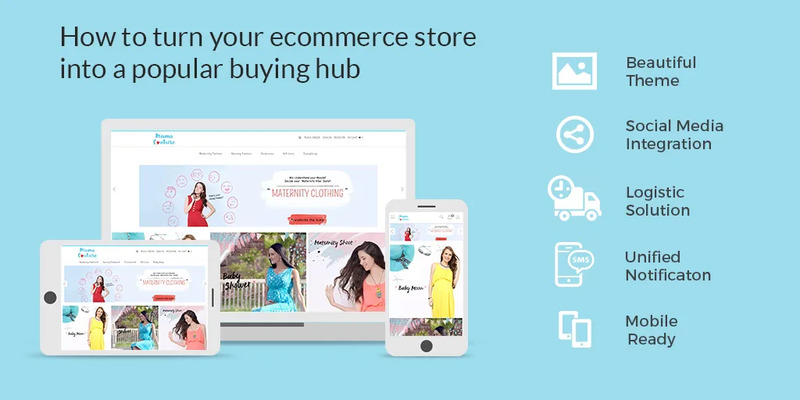 All stores built on StoreHippo platform can choose from our gallery of beautiful design templates, get high performance mobile ready stores, integrate multiple shipping partners using ShipKaro services, integrate various social channels and use unified notifications effectively to make their site customer friendly. So, what are you still waiting for? Employ these tools and techniques in your store and let us know how well they worked for your business.